Financial Literacy for Education Success is an online toolkit helping people learn the financial skills to reach their educational goals. Success – at community, trade, or technical colleges and universities – requires a step-by-step investment of time, talent and treasure. Financial Literacy for Education Success helps you customize your preparation to achieve your goals. Personal finance is a language with a unique vocabulary: income, credit, savings account, interest, stocks, etc. Learning and working with financial concepts requires teaching and learning at homes, at school, and in community organizations. Commonly used financial literacy terms are shared here to help you get started. Financial Literacy for Education Success gathers progressively ordered resources for teachers to use with students or learners to use independently. The tools and resources – which can be sorted using several filters across five learning stages – will improve your financial literacy, teach money management skills, and help you to chart a path to college and career success! Some goals are short-term and basic, such as buying food and securing shelter. Other goals require saving by regularly setting some money aside, such as for buying a computer or car. Longer-term goals may require that you invest in your education, experience and wealth over time. 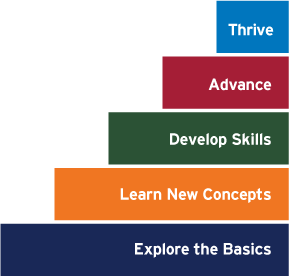 The following goals are organized by five steps to help build understanding and skills. Financial Literacy for Education Success began as an initiative of the Northern Illinois Regional P-20 Network and the NIU Center for P-20 Engagement with grant support provided by the Illinois Board of Higher Education and content direction provided by Econ Illinois. The interactive resource site and Financial Literacy for Education Success library are facilitated and powered by Illinois Open Educational Resources (iOER) and Illinois workNet. The website presence was made possible by NIU Outreach Creative Services. Gratitude and a special thanks goes to the Center for Workforce Development staff at Southern Illinois University, as we recognize their contribution to the searchable and robust resource sites.